Do u think the song "18 and Life" bởi Skid Row should be the (Archie) Chaotix's theme song? Who's ur yêu thích male member? Do bạn like sonic comics like sonic universe hoặc sonic the hedgehog?Well there's a website for you. It's called Sonic comics and universe. tham gia the club now and talk about your yêu thích comics? who's your yêu thích couple in the Chaotix? a comment was made to the poll: Witch Chaotix do bạn think is the best? a poll đã được thêm vào: Witch Chaotix do bạn think is the best? 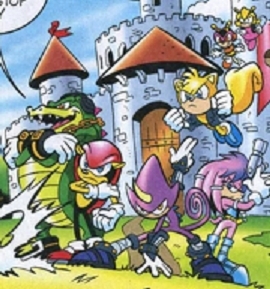 Who's the leader of the Chaotix?